In 1910, the relatively unknown Fred and Augie Duesenberg began designing what would become their walking beam engine. This style of engine had a unique valve arrangement in which horizontal valves, perpendicular to the cylinder axis, opened into a small space above the cylinders. The valves were actuated by very long and large rocker arms, referred to as “walking beams.” By 1913, Duesenberg engines had attracted some attention and were noticed by Commodore James A. Pugh. The Duesenberg straight-12 marine engine of over 750 hp. Large aluminum covers protected the walking beam rockers of each cylinder pair. Pugh was interested in building a boat to win the Harmsworth Trophy (British International Trophy for Motorboats) in 1914 and bring the trophy back to the United States. The Harmsworth Trophy was held each year by the country that won it the previous year. The British had won the trophy in 1913 (and 1912), and the 1914 race was to be held on Osborne Bay, England. Pugh was building a 40-foot (12.2 m) hydroplane named Disturber IV and needed powerful engines to ensure victory. Pugh brought the Duesenbergs into the project, and the Duesenbergs began designing a truly unique engine to power Pugh’s new boat. The one-piece aluminum crankcase for the Duesenberg straight-12 engine. The Disturber IV was to be powered by two separate straight 12-cylinder engines. Each engine was over 10-feet (3 m) long and was comprised of six two-cylinder blocks mounted on a one-piece crankcase. Each two-cylinder block was water-cooled with the intake valves in the middle of the block and the exhaust vales on the outside. The intake and exhaust valves were operated by long walking beam rockers. A single updraft carburetor provided the fuel/air mixture to a split manifold that fed four cylinders. Each cylinder had two spark plugs. Lubrication was provided by a pressurized oil system, a now-universal concept that was just being introduced at the time. The single-piece crankshaft was supported by seven main bearings. The use of aluminum was rare for the time, yet the Duesenbergs used it extensively in the engine’s design. The crankcase was one of the largest aluminum forgings made at the time and weighed 365 lb (166 kg) before the final machine work. Magnalite aluminum pistons were used, and the walking beam rocker arm covers were aluminum. The inline 12-cylinder engine had a bore of 6.75 in (171 mm) and a stroke of 7.5 in (191 mm). Total displacement was 3,221 cu in (52.8 L). The engine developed 750 hp (559 kW) at 1,500 rpm and 800 hp (597 kW) at 1,600 rpm. While it is possible that more power could have been obtained at a higher rpm, the often quoted 900 hp (671 kW) seems a little optimistic. The engine weighed 2,700 lb (1,225 kg). With both engines installed in Disturber IV and running at full speed, total fuel burn was reported at 132 gallons (500 L) per hour. These mighty 12-cylinder engines were built at the Duesenberg Motor Company factory in St. Paul, Minnesota. The engines were finished and installed in Disturber IV in mid-1914. The installation of the engines was mirrored so that the intake of the left engine was on the left side and the intake of the right engine was on the right side. This effectively allowed the engines to run in opposite directions. Thus, each engine’s single propeller rotated in opposite directions. The propellers were 24 in (610 mm) in diameter with a 40 in (1 m) pitch. Through a step-up gearbox with a ratio of 1.25 to 1, each propeller turned at 2,000 rpm while the engine speed was 1,600 rpm. On 2 July 1914, the Disturber IV was officially launched on the Chicago River. It underwent trials for a short time, achieving speeds in excess of 50 mph (80 km/h), before it was shipped to New York on 12 July 1914. In New York, it was loaded on the S.S Minnetonka and shipped to Cowes, England for the Harmsworth Trophy race to be held on 15-18 August 1914. 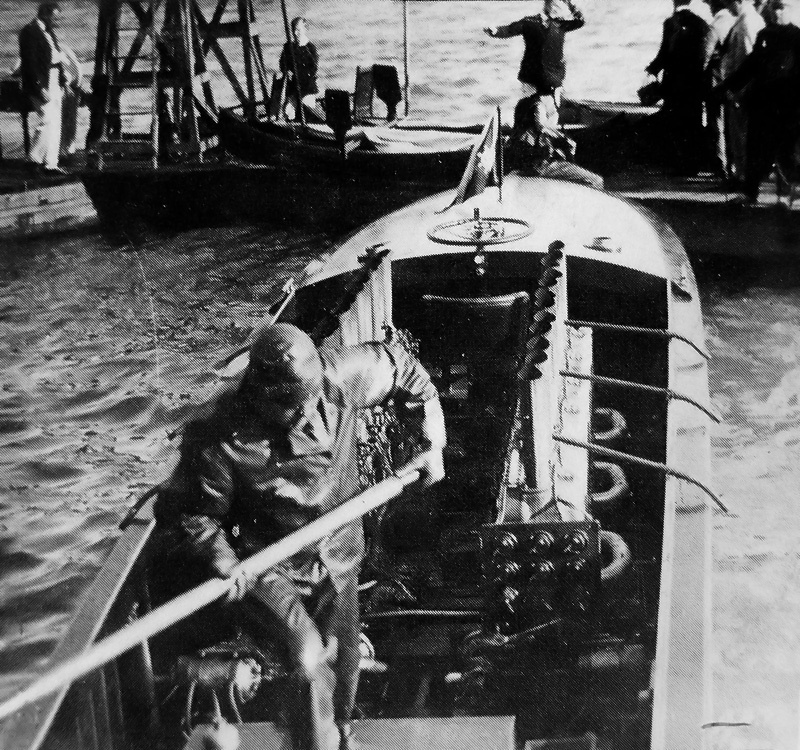 Augie Duesenberg accompanied the boat to ensure the engines would be trouble free. While the Disturber IV was in transit, Archduke Franz Ferdinand of Austria was assassinated, World War I began, and the Harmsworth Trophy was cancelled. The Disturber IV arrived in England only to be immediately shipped back to the United States without ever touching the water. It had been a rushed pace from the inception of the 12-cylinder engines to the voyage back to the United States. Now with spare time on his hands, Augie began to think of ways to improve the 12-cylinder engines. After arriving back in the United States, the engines were shipped back to the Duesenberg factory in St. Paul where they were disassembled and modified. The exact extent of the modifications are not known, but it was during this rebuild that the large, water-jacketed exhaust manifold was replaced by individual, vertical exhaust stacks. 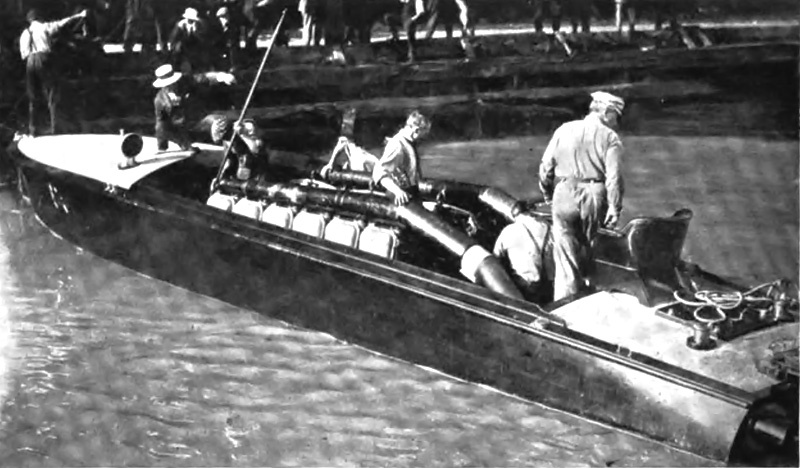 Disturber IV in July 1914 with the large, water-jacketed exhaust manifold atop each engine and leading out the boat’s stern. By October 1914, the 12-cylinder engines were back in Disturber IV, and the boat was turned loose on Lake Michigan. 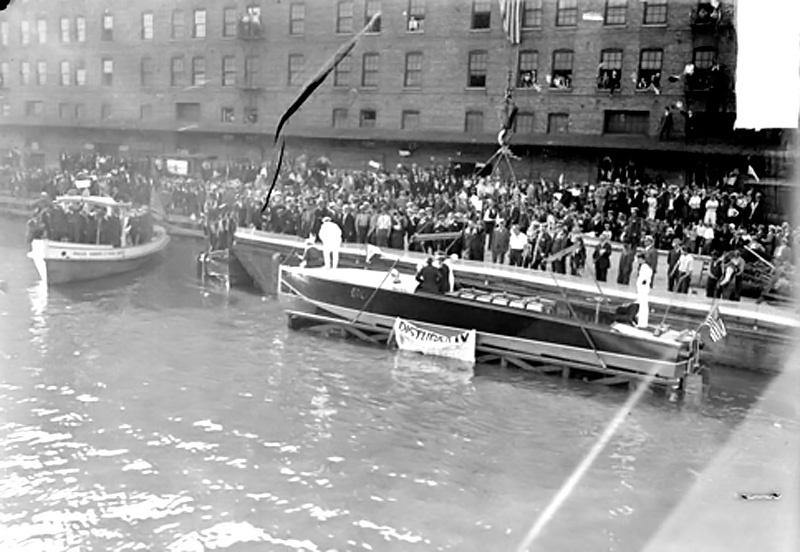 Pugh, accompanied by mechanics Charles Swanson and Henry Suttkas, won a special race off the coast of Chicago, Illinois on 20 October 1914. Two 14.83 mi (23.87 km) laps were run for a total distance of 29.66 mi (47.74 km). Disturber IV completed the first lap at a record speed of 56.6 mph (91.1 km/h). The second lap was completed at 47.0 mph (75.6 km/h), and the boat averaged 51.4 mph (82.7 km/h) over the total course. Disturber IV finished 17 minutes ahead of the second place boat. By October 1914, the Duesenberg engines in the Disturber IV had been modified with individual exhaust stacks. The pipes leading overboard were the cooling water outlet for each cylinder pair. Note the intake manifolds on the right engine. In 1915, the American Speed Boat Championship was held over three days in early September on Lake Michigan. Each day a two lap race was made over a 15.25 mi (24.54 km) course for a total distance of 30.5 mi (49.09 km). The winner of the first day’s race would receive the Wrigley Trophy. During the first race, Disturber IV was in the lead after completing the first lap at 55.4 mph (89.2 km/h). The second lap was completed at 44.7 mph (71.9 km/h), and the boat averaged 49.5 mph (79.7 km/h) over the entire distance. Disturber IV won the Wrigley Trophy—and finished nearly 10 minutes ahead of the second place boat, Miss Detroit. During the second day’s race, Disturber IV turned the first lap at 55.3 mph (89.0 km/h) and the second at 55.2 mph (88.8 km/h), averaging 55.2 mph (88.8 km/h) over the 30.5 mi (49.09 km/h) total distance. Disturber IV was undefeated the third day and won the American Speed Boat National Championship. A few days later on 12 September 1915, with the Duesenberg engines running at a smooth 1,600 rpm, Pugh and the Disturber IV became the first to break the mile-a-minute mark on water. Pugh made six timed speed runs on Lake Michigan near Chicago. His fastest run was 61.2 mph (98.5 km/h), but is often reported as 62 mph (99.8 km/h), and another run was at 60.4 mph (97.2 km/h). Disturber IV’s six run average was at 59.2 mph (95.3 km/h). 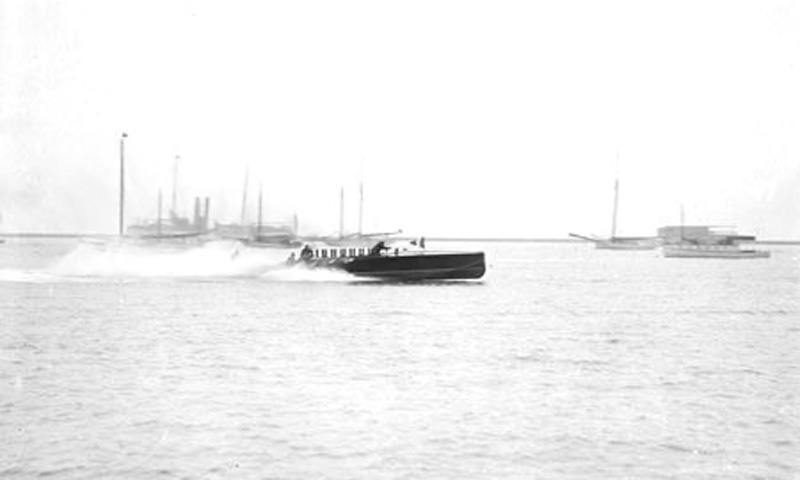 Disturber IV in the 1915 American Speed Boat Championship on Lake Michigan. In the background are Peter Pan and Miss Detroit. Late in 1915, Pugh put Disturber IV in storage and stated he would not race again until the next international meet. Pugh had built the Disturber IV solely to win the Harmsworth Trophy, and he found dominating other boats on Lake Michigan was not very fulfilling. With World War I raging, all international meets had been cancelled until the end of hostilities. What Pugh did not know was that the war would continue for another three years, and the next Harmsworth Trophy race would not be held until 1920. When peace did return, the world was a different place. The war had advanced engine technology, and the powerful Disturber IV was no longer on the cutting edge. The ultimate fate of the Disturber IV and its straight-12 Duesenberg engines is not known. Disturber IV’s Duesenberg engines attracted so much interest that the Loew-Victor Company retained Fred Duesenberg as a designer. Fred went on to design six- and eight-cylinder engines based on the 12-cylinder engine’s design. In early 1917, Duesenberg Motor Company and the Loew-Victor Engine Company combined to form the Duesenberg Motors Corporation. Although it was not a direct path to the Duesenberg automobile, the engines for the Disturber IV helped open the door to the Duesenberg’s future endeavors. This entry was posted in Marine on 2 April 2013 by William Pearce. The size of that crankcase casting is amazing! It was a shame that Disturber IV never got to compete against the best British boats in the Harmsworth Trophy. Superb article…. Only wish we had sound! Thank you for your comment. I wish there was sound too. I bet the two engines going a full song was terrific.